A group of six start a Jane Austen book club. They don't all know each other at first but eventually become friends through Miss Austen's words. There are five women and one man. One mother/daughter. Those that have been married, those that haven't. Everyone has a different perspective from life that they bring to their book club meetings. With each month, we learn a bit more about the host of the book club. Until we get closer to the end of the book and everything is jumbled together and not specific to the person hosting the discussion. This book was an odd one. The first chapter I felt engaged with the story and was interested with the character being described. Then the next chapter came and I didn't care much for the character so I was bored. It would go back and forth for me. Some of the stories were interesting, some were boring and made me want to skip pages. I couldn't keep the characters straight other than Grigg, the only man in the group. This is simply because I didn't care, since they were so boring! I was completely disappointed with this book. I'm surprised I finished it, I probably should have given up earlier. First Line: "Each of us has a private Austen." Dragonscale is sweeping the world, burning people and leaving nothing but ash. Maine is a charred wasteland and people hunt those with dragonscale to kill them. Harper works at the local hospital to try and help those sick as much as she can but even the hospital isn't safe. When that goes up in smoke, Harper finds out she has the disease. Harper and her husband made a suicide pact when this disease first started spreading but now that Harper finds out she's pregnant, she's not so interested in killing herself. He husband, who isn't sick, still thinks she should die. Harper escapes to a camp that hides those with Dragonscale with the help of the fireman. They have found a way to control their disease, which gives Harper hope that she'll be able to live with her baby. But with more than 100 people in this camp, there are 'Lord of the Flies'-type social problems at the camp. I really enjoy apocalyptic stories because of the imagination that it takes to come up with what kills off most people and how people are coping with it. This is a unique disease and a unique way of dealing with it. Of course, at the core of it this book isn't about the scale. This is just the icing on the cake. But it's really nice icing. The core of this book is Harper, her relationship with her husband and the fireman, and how these hundred folks with dragonscale create (or destroy) a community they've built up for themselves. Harper, for the most part seems pretty sensible. She's a nurse, she loves Mary Poppins, and she gets rightfully annoyed at people. Her ex-husband is a piece of work that wants to kill her and her new love interest and create birds made of fire. Then there's the community, which is full of a whole bunch of interesting characters. While I really enjoyed this book, I won't give it a perfect review for two reasons. First, I feel like the book could have lost a hundred or two pages and not lost anything in the story. Second, because Harper and the fireman fall in love after only talking to each other or seeing each other 3 times, which is completely unrealistic. I still recommend this one though! Thanks to TLC Book Tours for letting me be a part of this tour. Be sure to get your copy at Harper Collins. First Line: "Harper Grayson had seen lots of people burn on TV, everyone had, but the first person she saw burn for real was in the playground behind the school." 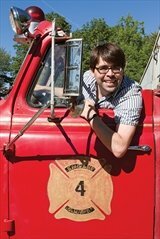 Joe Hill is the author of the New York Times bestsellers Horns, Heart-Shaped Box, and NOS4A2. He is also the Eisner Award-winning writer of a six-volume comic book series, Locke & Key. He lives in New Hampshire. Find him on Facebook, Twitter, or at his website. Professor Langdon wakes up in the hospital, thinking he's still in Massachusetts. He can't remember anything that's happened over the last few days and is told that a bullet grazed his head. When an Italian doctor enters his room, Landon realizes he isn't in the States, but rather in Florence. Then when that doctor is murdered before his eyes Langdon knows he must run. Another doctor also in the room, Sienna, helps him by bringing Langdon to her home and trying to figure out why he's in Florence. There's a mini projector sewn in to his coat which starts Langdon on his search for Inferno. The two realize they are hunting a plague, hoping to find it before it's set loose on the world. Following through Dante's Inferno, they must follow clues from this important work and from other artists that have used it as inspiration to find what they are looking for. Brown's first book with Langdon, Angels and Demons is still my favourite, but this was pretty good. Brown is a master at writing suspense and as a bonus, you learn about some art and history along the way. I don't know much about Dante's Inferno. This made me want to read it just a little bit. Though I know I'd probably never understand all the intricacies. This isn't award winning literature but it's definitely a fun read. First Line: "I am the Shade."